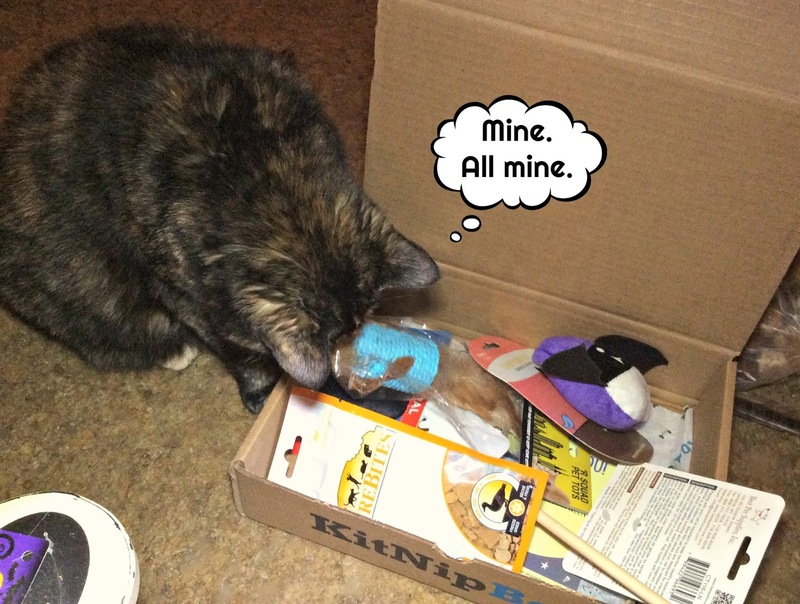 Anyways, I was super excited when Mommy showed me the box and more than eager to dive right in. Here's what I found! * Best Pet Burlap Mouse with Feather Tail. One word - feathers!!! This was the first thing I pounced on in the box. * Paws 'n' Purrs Candy Corn Bat. Mommy hopes to snitch this toy for our Halloween decor. Not happening. * LEAP Owl Pal. The purrfect size to bop around the house. * Playful Pet Jumping Spider Finger Dangler. My favorite toy in the box so far! * Autumn Scarecrow Wand. This little guy is so much fun to bat around! The corn husk limbs are lots of fun to chew on (with supervision, of course). * 'R Squad Feather Roller. 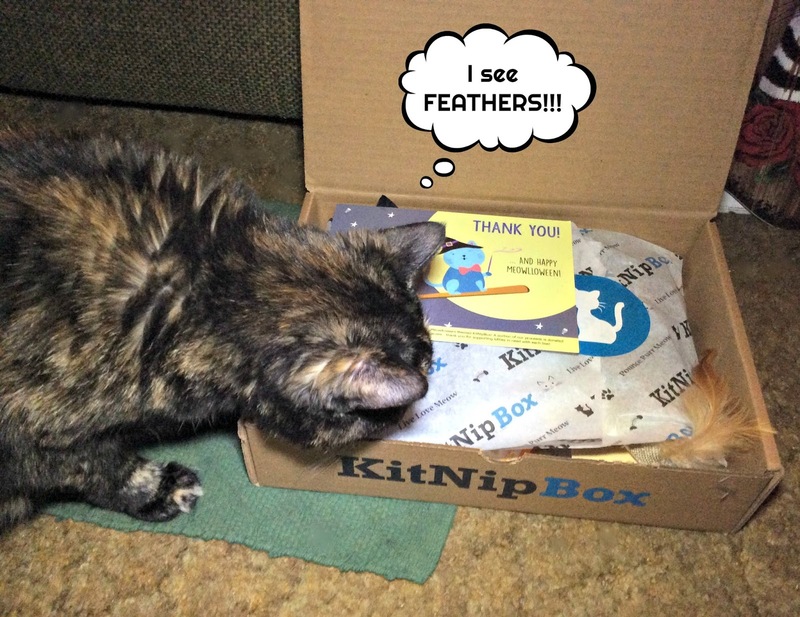 How did the KitNipBox peeps know how much I love feathers??? * PureBites Freeze Dried Duck Treats. I'm not a huge fan of freeze-dried treats so we haven't opened these yet. It goes without saying that I've been having so much fun with my KitNipBox! As I mentioned before, the jumping spider finger dangler is my favorite toy in the box so far. I do enjoy watching and pouncing on real live spiders too, but they never last long once Mommy spots them so this toy makes a good replacement, and it's something Mommy and I can play with together. 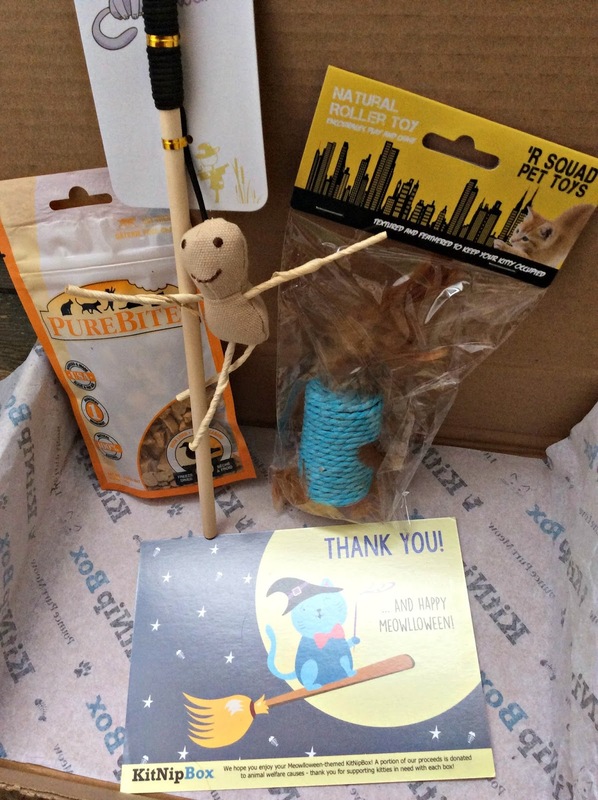 If you're unfamiliar with KitNipBox, they are a monthly subscription box of cat treats, toys, and other goodies for your cat. 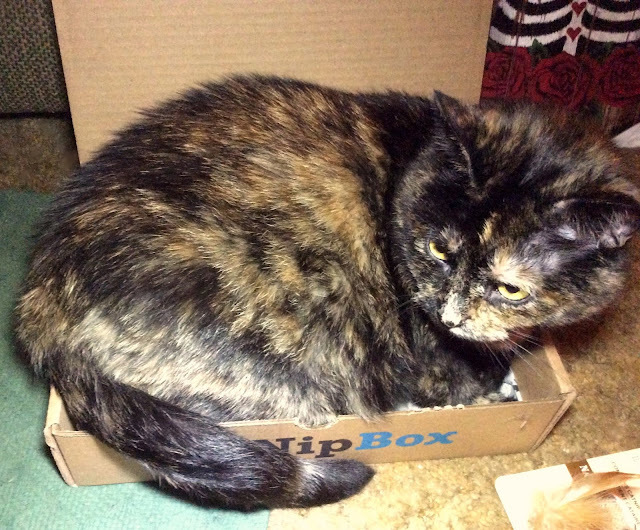 Subscriptions cost $19.99 per month for the Happy Cat box, and $29.99 per month for the Multi-Cat box. You can even request "no treat" boxes which will contain a special item to replace the edibles. Shipping is free, and you can easily cancel at any time. 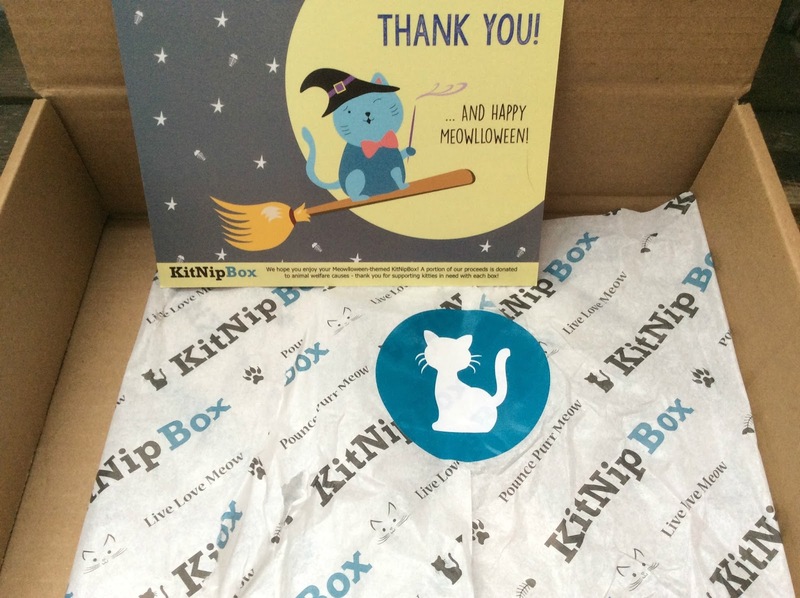 PLUS each month KitNipBox donates a portion of their proceeds and products to shelters, rescues, TNR efforts, and a variety of other feline welfare causes. Each box you buy supports kitties in need! If you'd like to treat the special cat(s) in your life to a KitNipBox this Christmas (or any time of year), simply click on the graphic below. It's an affiliate link which means I'll get a little spending money for Christmas if you buy something! 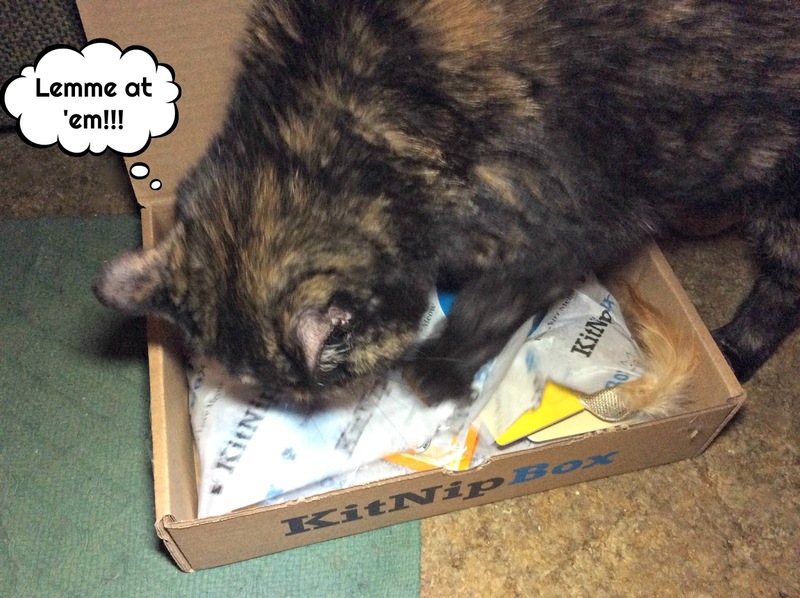 Disclaimer: We received a free KitNipBox in exchange for an honest review. All opinions are our own and we never recommend a product we don’t fully believe in. What a pawsome gift box! Wow, what a fabulous bunch of toys! I didn't know PureBites had freeze dried DUCK treats! We do love freeze dried treats here (all of us! ), so my human will have to keep a look out. That was an awesome box of goodies, Mudpie! Oh, what purrfect treats to get on Halloween, Mudpie! We're still a bit in the Halloween mood around here, and these spooktacular treats made us so happy to see. This here human also really appreciates that KitNipBox has a "no treat" option, since the kitties will only accept roughly two kinds of treats. Perhaps this will be one of the kitties' Christmas gifts here! Thank you for sharing this with us, Mudpie and Melissa! What a spectacular box! It's just purrfect for this time of year and all three of us here just love everything! Wow! You got a lot of cool stuff in that box! And feathery things, too! 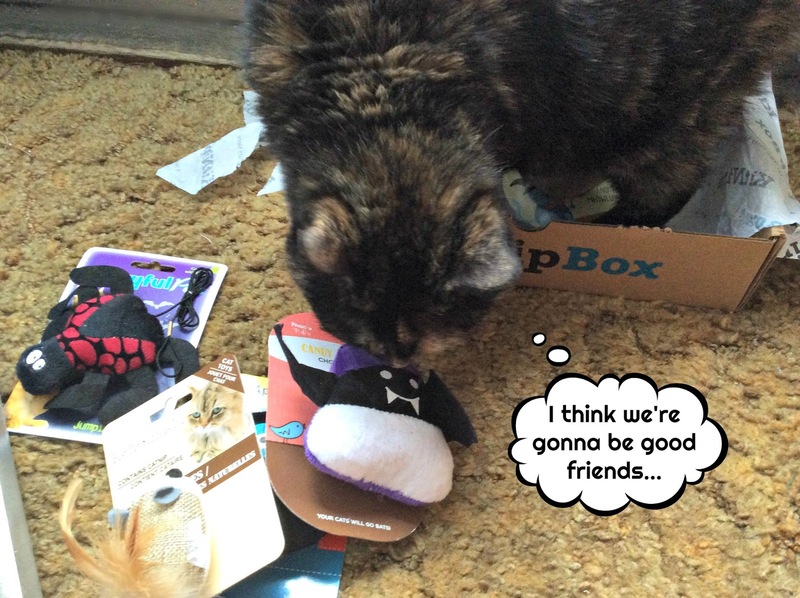 I think my favorite item in the box is YOU, Mudpie! I'd TOTALLY sign up if you're included!!! 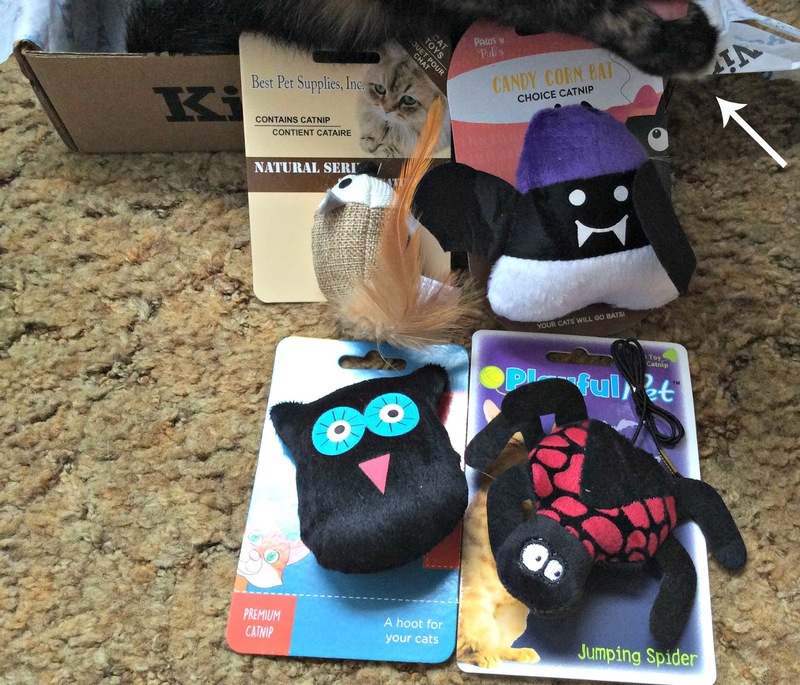 Then again, those are pretty cool toys ... and a cat can never have enough, right?! The photo of you INSIDE the box made me LOL, Mudpie! How wonderful that you scored some good stuff, but the duplicity of your human is scary. No matter how good the prezzies may be...how could any cat resist...THE BOX!? Purr! Oh, WOW! Great gift box! 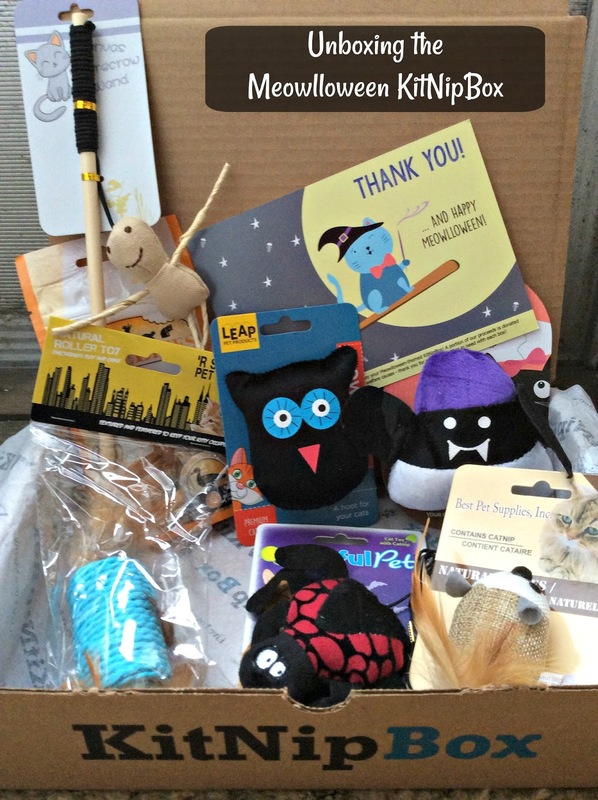 Now that's a fun box of goodies! oooh, that looked like a fun one, for sure!